Fifty-two North Texas Master Naturalists attended the 2018 Texas Master Naturalist Annual Meeting in Georgetown in October; our participation was far greater than any other Texas chapter. In addition, we had a record number of presenters from our chapter. We also submitted photos, a video, artwork, and a project into the competition. We won in the media category for the brochure from the Spring 2018 project “What Kind of Naturalist Are You?” and were awarded second place in the drawings/paintings category for the naturalist drawings used in the winning brochure. The video which chronicled the project at Rogers Wildlife Rehabilitation that Rich Laffey submitted won second place. None of our photos placed, but the competition was stiff as the quality of photos submitted has improved; we will be back with more great photos next year. Our project entry showcasing the Tiny Trekker program did not receive an award, but was very popular among the Master Naturalist chapters visiting the display. Many requested additional information, so they could start a Tiny Trekker program in their outreach programming. This conference had many more field trips planned than in previous years. The field events were challenged by the amount of rain that had fallen the week before. It was hard to demonstrate a prescribed burn in a park that had more than an inch of rain the day before. Ricky Linex was unable to lead the riparian hike at the nearby creek, as the water was three feet higher than normal and the features of the riparian zone that he had planned to discuss were not visible under all the water. Each presentation had a backup plan, so we were able to burn a little hay to demonstrate the prescribed burn principles and Ricky had his trusty slide show to show riparian conservation practices. 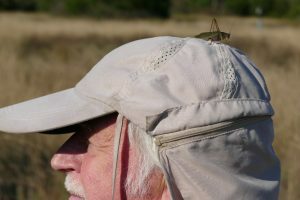 Much of the value of the Annual Meeting is not in the competitions, but in the exchange of ideas among the master naturalists. There was a fantastic Nature Discovery Trunk on display which featured many unusual manipulatives that could be used in an outreach event. I asked the naturalists showing the trunk about their display and found out that they were inspired by the seminar that John White and Lee Kelton and other chapter members did a few years ago about how to use a Nature Discovery Trunk; the pollinator and bird trunks that we used as examples really got their attention. The attendees were so inspired to make their own trunks they returned to their chapter and were able to secure a grant to purchase the materials for the trunks, as well as some other things they needed for outreach. They were grateful to have been inspired by our trunks and did a masterful job of purchasing the materials needed to make an impactful trunk with all that grant money. I was inspired by the idea of securing grant money to use for our activities. The 2019 TMN Annual Meeting will be held at the Rockwall Hilton and the North Texas Master Naturalists will be the host chapter. When the announcement was made previously that the 2017 annual conference would be in Corpus Christi, the North Texas chapters were rather forceful about having an annual meeting in North Texas. We felt that the resources in North Texas, both for field excursions as well as human resources, would enable us to present a viable conference to the rest of the state. We will have our first planning session in the near future at which the chapter presidents along with Mary Pearl Meuth, Program Coordinator from the state office, will decide what needs to be done and who will do it. I don’t want to overstep before we actually have a meeting, but I believe that our North Texas Chapter will be instrumental in putting together a memorable conference emphasizing our North Texas assets. As is customary, the board will have a retreat in January to plan our activities for the next year. You may contribute your ideas to the planning session by completing the survey that we sent out to our members. The survey gives you the opportunity to express your opinion about the time and place of our chapter meetings, financial issues and how we pay for things, and programming options. If you haven’t already filled out the survey, please do so; your input is important to us. 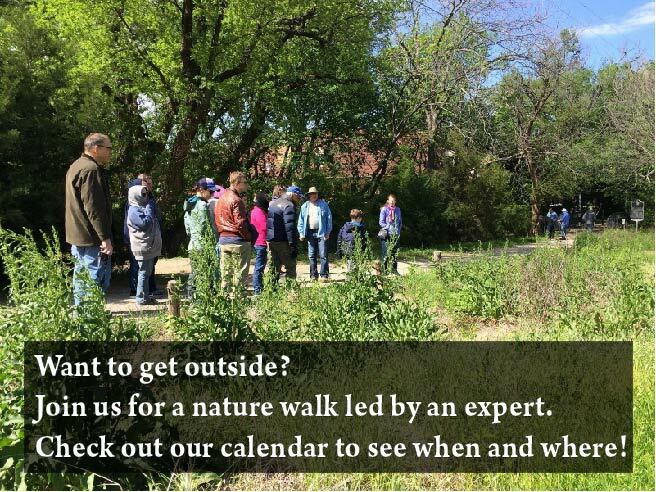 In addition to hosting the 2019 TMN Annual Meeting, we also have two other activities that we will have to schedule for next year. We will sponsor an Urban Wildlife Conference in August for members of our community (not necessarily master naturalists). 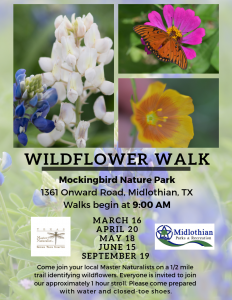 Sam Kieschnick, our Texas Parks and Wildlife advisor, will set up a one-day program with timely topics and our chapter will handle the administration of the program: publicity, registration, lunch and snacks, and so forth. There will be many opportunities for volunteer hours [in] planning and setting up this meeting. Dallas County has sold the building on Marsh Lane used by AgriLife and has leased the Brinker International Building on LBJ and Hillcrest from an Addison-based real estate investment partnership. Brinker is building a new facility at Cypress Waters and will lease their current building until they can move into the new facility. Once Brinker moves out, the County will modify the Brinker building as they see fit. At this time, we don’t know the configuration of the new county building or when it will be ready for the county offices to move in; the earliest date for the move seems to be September 2019. We will want to make certain that our Chapter’s basic needs for storage are met. We will keep you posted, but unfortunately, we know very few of the details at this time. So, 2019 looks to be an interesting year for our chapter. At this point, we only know that we will be hosting both a state and a local conference and moving our office. There is not much more we can do now except be flexible and ready to act when it becomes necessary.